The M6 Toll road was opened on Tuesday 9 December 2003 BBC - "M6 Toll road opens", and was Britain's first "turnpike" for a hundred years. It is an underused asset. Many people, including hauliers, are deterred by the toll and this means that there is congestion on other roads. The company that operates the road has lost money each year, to break even, the toll income would have to be about 50 per cent higher. Proposals for a "Birmingham Northern Relief Road" to relieve congestion on the M6 go back many years. Around 1990 it was decided that it would at long last go ahead but would be a private scheme. Motorways are of course built by the private sector anyway. But in this case the private sector would also finance and run it, recovering the construction and running costs through tolls. Normally tolls come under a Private Act which applies to just one operation. For the M6Toll road a general public act was used as the authority for tolling - the New Roads and Street Works Act 1991. The Act has only been used on one other toll - the Skye bridge (now free). The Act makes it a criminal offence to refuse or fail to pay the toll. It also allows the operator to charge "a reasonable sum to cover administrative expenses" to recover any unpaid tolls. In the case of the M6 Toll if you don't have sufficient money when you arrive at the toll booth , and don't pay within two days of a notice, then there is an extra charge of ten pounds. It has been asked why the Government (though the road opened under a Labour Government, it was a Conservative one that made the contract) negotiated a contract which gave the operator a free hand to set toll levels. The reason is that whether it was new Labour or Conservative they tend to lean towards a free market philosophy rather than regulation. Though there is no other tolled competitor to the M6 Toll, they do of course compete with the untolled alternatives. In fact the M6 Toll is probably the only toll in Britain that is subject to competition, as with other tolls the vast majority of drivers have no practical alternative. It might also be argued that if the private sector were to build and operate a regulated toll road, then the enabling legislation would have to set a high toll, because of the additional risks arising from the company not being able to set future price increases. The contract for the new road was awarded to Midland Expressway Ltd (MEL), a new company owned by MIG (Australian) but with Italian interest (which was bought out in June 2005). MEL in turn awarded a contract to a consortium of construction companies to build the road. Construction started in September 2000, and the road was opened in December 2003. The construction cost was estimated at �0 million. Midland Expressway have a concession to collect the tolls for 50 years. They can charge whatever they like. The agreement between the Government and the company may include secret clauses, designed to encourage traffic to use the toll road. The Government were taken to court before the road opened, but the judges backed the Government's action in refusing to reveal the full agreement. Later the Freedom of Information Act took effect and we requested a copy of the agreement. Initially only a redacted version was released, but on 26 July 2007 they released what seems to be the full agreement. This is not mentioned on the DfT site pages that deal with FoI but should be available by ringing them on 0207 944 8300. There was an introductory offer of �off all tolls for a limited period when the road opened. This made the initial daytime car toll �or as they said "only the price of a cup of coffee". The tolls for lorries were reduced on 23 July 2004 from � to � this was to last till Xmas 2004, but was then extended. The toll for cars was increased from �to �on 16 August 2004. From 1 January 2009, the car toll went to �70 and the van / lorry toll to �40. From 1 March 2010, the car toll went to �00 and the van / lorry toll to �.00. From 1 March 2011, the car toll went to �30 and the van / lorry toll to �.60. From 1 March 2012, the car toll went to �50 and the van / lorry toll to �.00. The other main toll rates as from 1 March 2012 are - motorbike �00, and car with trailer �.00. There are slightly lower toll rates on Saturdays and Sundays (e.g car �80), and slightly lower again between 23.00 and 06.00 on all nights (e.g. car �80). Drivers can get a "Tag" so that tolls are debited automatically to a prepaid account. As with other tags they are RFID devices using microwaves. Drivers have to pay a rent of one pound a month on the tag, but they get a discount of 5 per cent on the tolls. As there are about 8 intermediate junctions on the old M6 between the point at which you could join the M6 Toll (Cannock at one end and the M42 at the other), it is not straight forward to say what the traffic is, as the level varies between junctions. But in simple terms, prior to the opening of the Toll, the old M6 was used by 175 thousand vehicles a day. Initially the traffic on the M6 fell by about 10% but by 2008 it was back to about the same as before the Toll opened. Taking the two roads together there are about 35,000 more vehicles (as at June 2011). Only a small part of that increase seems to be additional long distance traffic, it seems to be mainly local traffic which was originally on non motorway roads in the area. Traffic using the Toll peaked in summer of 2004, at about 55,000 vehicles a day. There was then a decline, which bottomed out summer 2006. Traffic rose again, peaking about spring 2007, it then entered another decline and has bounced along the bottom since the end of 2008. There are more details at our Traffic figures page. October 2005 report - summary report (html) full report(pdf file). October 2009 report -summary report (pdf file) Part A (Introduction; Long term trends in traffic volumes) (pdf file) Part B (Daily traffic volumes; Peak Period Flows; Birmingham Box & the Midlands Area) (pdf file) Part C (Strategic Screenlines; Classified Data; Journey Times; Safety) (pdf file) Part D (Environment; Conclusions; Appendices) (pdf file). Governments have been doing their best in various ways to funnel traffic onto the toll road. Most of this funneling was and is through the way that the junctions were designed (so that straight on means that you are on the toll and you have to turn off to avoid it) and signage. On 24 May 2006, the Labour Government announced that the M6 Toll operators were being allowed to build a major new road to funnel more traffic (which would come from the M54) into the northern end of the M6 Toll and would also change the access at the southern (M42) end. It was implied that the toll operators were fairy godmothers, though if you looked at some of the stories in the Australian papers (see links on our May 2006 news page), you would see a different explanation. The new link to the M54 made no sense as traffic using it would have to travel the opposite way to get on or off the tolled road. For a long time it has looked as if this scheme is dead, as the company would be throwing good money after bad. A few links - Express and Star - "Link road plan hailed as a massive boost" Highways Agency - "M54 to M6/M6 (Toll) Link Road. In September 2006 the Labour Government announced an experiment of using the hard shoulder to increase road capacity. The only place in the UK to get this increase was on the M42 between the junction with the M40 and that with the M6. Indirectly this would encourage further traffic to use the Toll. From November 2009 the hard shoulder running scheme was expanded to allow it on the M6 beween the junction with the M42 (4) and junction 5 - this scheme was Birmingham Box Phase 1 of the Managed Motorways scheme. There was a further extension on 22 March 2011 between junction 8 (with M5) and junction 10a (with M54). Phase 3 started in April 2012 (and there was a name change from 'Managed' to 'Smart motorway'). This phase links up the previous two phases and is due to be completed by June 2014. A fourth phase started at the end of October 2013 and covers junctions 10a to 13 (South Stafford) which is north of the M6 Toll. It is due to be completed in Spring 2015. The short term effect, and possibly aim, of these schemes is to increase congestion on the old M6 and thus boost traffic on the toll road. The suffering of drivers and boost to the tolls will have lasted 5 years. Thereafter the effect of the schemes on the tolls is likely to be negative, unless the Governmemnt come up with another congestion creation scheme. Economically the scheme makes no sense. The Government will have spent about �0 miilion on a schme that would not have been necessary if they had instead taken over and de-tolled the M6 Toll. On top of that drivers will have had to suffer 5 years of increased congestion. On 19 July 2004, The Transport Committee of MPs said that they were to look at both the existing M6 toll road and the proposed Expressway. This was our submission to the Transport Committee. On the 28 October 2004, the Committee announced that they would not look at this by itself, and instead looked at "Road pricing" though their inquiry did include the M6 toll - Transport Committee Seventh Report, March 2005 - Chapter 6 - "The M6 Toll". Most of the MPs on the committee seem to be keen for Governments to increase the use of tolls. Despite this they have ignored the topic for the last 9 years, possibly because they don't want to shine a light into this murky area. The Campaign for Better Transport (once called Transport 20000) generally lobby for more spending on railways and other public transport and against road building. They have taken an interest in tolls and in particular in the M6 Toll. In part they may oppose tolling because it has been pushed as a way of finacing the building of new roads. But whatever their motives they have published two well researched reports on thre M6 Toll - . 'The M6 Toll - ten years on' December 2013 'The M6 Toll, five years on' August 2010. The road is owned and operated by Midland Expressway Limited (MEL). MEL was originally mainly owned by MIG (part of Maquarie, an Australian banking group) but an Italian company had a minority interest which was bought out in June 2005. In 2006 Macquarie Motorways Group Ltd (MMG) seems to have become the owners of MEL, but we assume they are merely another level that separates MEL from its ultimate parent. At the end of 2009, MIG hived off their more toxic assets, including the M6 Toll, into a separate parent company - Maquarie Atlas Roads, which is based in Bermuda. But this seems to have had no effect on MEL or MMG. The rest of this section only deals with what has appeared in the MEL accounts. The last published MEL accounts (as at December 2013) are for the year to December 2012. Road costs �0 million, Land � million, "Plant and Machinery" � million, and Service Area � million. Depreciation has reduced the book value of the M6 Toll to �8 million at December 2012. The 2012 accounts show that they made a loss for the year of �.7 million, on a turnover of �.1 million. The cumulative losses at December 2012 were �7 million, and the 'Total shareholder's deficit' was �0 million. The road somehow needs to increase its turnover by 60%, just to break even. It could, of course increase toll income either through increased traffic or price rises. Small increases seem to have little immediate effect on traffic; the problem that the company (and the bankers that put up the money) has is that larger price increases might cause traffic to fall significantly. Like Mr Micawber, they must be hoping for something to turn up! Are we not better off because the road is there, even if it is tolled? Hasn't the building of the road helped to relieve congestion? - Extra road capacity is going to be of benefit, but a toll road will never reach it's full economic potential. What is the point of using up all this land, time and money to build a road, and then have it virtually empty? Most lorries are using inferior roads. This doesn't make sense. They should not be discouraged by tolls from using the most suitable roads for their journeys. Is not the road a success because 25% of vehicles are using it? - Only 25% of vehicles using it, just proves that tolling is a failure. Most of the traffic is still on congested roads. If the road was toll-free it could take 50% of the traffic and truly relieve congestion. There would not even be 25% usage if it was not for the covert funneling of traffic onto the tolls road, and the protracted roadworks and lane closures on the old M6. Doesn't the toll road give drivers a choice? -The choice is only for those able to pay. Tolls are a regressive tax. They might suit the driver of a Mercedes who will have an almost empty road, but they deny full benefits to ordinary drivers who are already hit by excessive tax. The driver of a lorry does not have a choice, as his company will decide. And it's catch 22 for roads users. If more cars and lorries start using the toll, then the Toll company will increase the prices, and the Government will force more toll roads down drivers throats. -The Government should buy the road. It cost about �0 million to build, mainly financed by bank loans. The Government collects more than that every week from drivers. What would be the benefit of removing tolls? -Traffic would be drawn away from congested roads, and you would have a better overall flow of traffic. This would reduce driver frustration, save wasted fuel, and reduce vehicle emissions. It would also boost the economy over a wide area. Could the traffic on the old M6 be managed better in some way? -There are various ways that traffic management can be improved, most of them might not be significant, but one can be. That is minimising lane closures due to road works. One way of doing this is to spend more money to make sure that schemes have as short a duration as possible by working round the clock. Other things that might have an effect is seeing if work can be done at night with the lanes open during the day, and reviewing whether lane closures are necessary (e.g. they may close off a lane for a mile for work that is only taking place over a far smaller distance, and so on). -South of Cannock (where M6 Tolls starts), there would be a tremendous improvement if the toll was removed. But there is also a need for improved capacity going north from the end of the M6 Toll (at Cannock) towards the North West of England. The most obvious step would be extra lanes (or at a pinch the conversion of the hard shoulder). But we also think that the creation of parallel roads would help. E.g. a new long distance untolled route (not necessarily to full motorway standards) from the North West of England going south on a route between the Welsh border and the West Midlands, crossing the M54 near Telford and meeting up with the M5 somewhere between the West Midlands and Gloucester. This is what one driver wrote to his MP:- Sometimes my firm send me down to Chepstow, but they will not pay the Severn bridge tolls so I go down through Gloucester along the narrow A48 causing unnecessary noise and pollution to the people who live there (I work nights). There is a perfectly good M5 and bridge to cross but the tolls keeps me on the A48 . Sometimes they send me up north and on the way back I queue up on the old M6 through Birmingham while the new toll road is carrying only light traffic, the M6 is congested with vehicles that would have been on the North Birmingham relief road, had it not been a toll road. What a waste of resources, time and thousands of gallons of extra fuel burnt. The fact that the old M6 is free and the toll road costs �for a hgv encourages all lorries to use the old M6. Does this make sense? How can the politicians call the M6 toll a success? What about all the traffic which has to use the old M6 for local use within the West Midlands, they have to put up with congestion and delays which is avoidable if the relief road was not tolled." On 6 July 2004, Alistair Darling, the Transport Secretary, made an announcement (previously leaked through the BBC) about the proposed widening of the M6 from the Midlands to the North West. He said that they were thinking of building another toll road from the north end of the existing M6 Toll towards the North West of England. He called this an "Expressway" and did his best to sell it:- Government Press Release - "Choice for the Motorist" BBC - "Second toll motorway to be built"
Prior to his announcement it had been expected that the M6 would be widened between Junction 11 at Cannock, north of Birmingham and Junction 20a, the M56. He said that instead a new dual carriageway road with 2 lanes in each direction would be built alongside the existing motorway, and that this would be easier and cheaper than adding extra lanes to the existing carriageways. What was even less expected was his decision that this new road would be TOLLED. Most of those commenting on the Government's proposals seemed to welcome it, apart from those who were opposed to any road building. There was a campaign against the new road by Greens, though it fizzled out by autumn 2004:- "No M6 Toll"
Those who did welcome the proposal were probably welcoming a new road, and turning a blind eye to the intention to toll it. The government's consultation paper on the plan to extend the M6 Toll gives little justification for the idea. It mentions two existing tolls, the Severn Crossing and the recently-opened M6-Toll, Birmingham relief motorway. We are particularly alarmed at the mention of the Severn Crossing. That was due to be made toll-free, when the construction cost had been recouped. The latest estimate for that to happen was 2016 and campaigners have been urging that tolls should be lifted before then. But it now seems the Government has no intention of dropping these licences to print money at the expense of already hard hit road users. 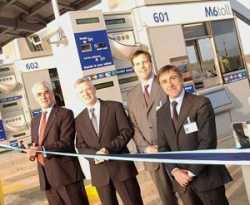 The Department for Transport hails the M6 toll road as a big success. It has certainly helped to relieve congestion, but being tolled makes no sense, as the cost will tend to keep most traffic on other roads. The Government say that the new road is now taking 20% of the traffic. They see that as proof of success. But it just shows how idiotic tolling is since if it was toll-free it could take 50 per cent of the traffic and truly relieve congestion. The government seems to believe in choice, but it seems only for those able and willing to pay. What they really believe in is keeping hold of as much as possible of the � billion collected in road taxes. Of the �400 that they get in taxes on each vehicle, they are only spending �0 on roads. We wonder what Alistair Darling, the Secretary of State for Transport AND Scotland, thinks of the Scottish Parliament reviewing all tolls in Scotland to see if they can be abolished. We are asking the Department for Transport to produce detailed figures on which the decision to toll the new road were based. Previous studies on other roads have concluded that tolls are a damper on the economies of the surrounding area. We wonder whether the government have come up with some contrary figures, or whether they have not bothered to find out. If a new road is justified on economic and environmental grounds, then it should be built. But we do not want a return to turnpike days. A patchwork quilt of tolls around Britain is unfair to those drivers who will have to pay even more to use the roads. Tolls are a regressive tax. They might suit the driver of a big fast car who may have an almost empty road, but they deny full benefits to ordinary drivers already hit by excessive tax." Comments on the tolling proposals had to be sent to Department for Transport by 21st September, but this was then put back to 21st October 2004. NAAT submission to the consultation. There was then a deafening silence for 9 months. Though an anti roads group, Transport 2000, gave out the broad results of the consultation in their December 2004 magazine which quoted "Sources within the Government". The general public had to wait till 19 July 2005. Then the Government revealed that 99% of consultees were opposed to the tolls road. The Government decided however to ignore this and to press ahead drawing up detailed plans for the tolled road. Though "pressing" is probably the wrong word, as it was now 11 years since the widening of the M6 was agreed. It would be more accurate to say that the Government was doing nothing. There would be lots of work for the draughtsmen and the spin doctors, but none for the road builders. We than had to wait another year before on 20 July 2006, there was a Government leak via the Press Association that the proposal for a new M6 Toll has been scrapped:- Guardian - "�n M-way toll plan to be scrapped". As might be expected the Trolls Times said that the "decision will anger motoring groups, which had hoped that the expressway would be part of a network of privately funded toll motorways relieving traffic bottlenecks across Britain". As usual the Times and the other toll supporters, such as the RAC Foundation and the Freight Transport Association, were living in a different world from the vast majority of roads users. Then we had the Official Press Release from DfT. Alarmingly, it was implied that they would toll the existing road to "manage demand". The announcement was then made to MPs. "The Highways Agency's modelling suggests that an Expressway would have a significant impact on both the levels and the mix of traffic using the Expressway and the M6. In particular, it is likely that the proportion of heavy freight traffic on the M6-which is already relatively high-would increase further, requiring additional infrastructure works at junctions to provide safely for traffic joining and leaving the road. This, together with providing for the appropriate range of access options at each junction between the Expressway and the existing M6, would require the demolition of many existing structures and reconstruction of 20 per cent. of the existing carriageway. The Expressway would also have a much larger land take, requiring land than the widening. The Expressway and associated works would cause more disruption to existing traffic and would cost some 15 per cent. more than widening. Although on-line widening would necessarily involve some disruption to M6 traffic during construction, the phasing of works could mean additional capacity being provided sooner than an entirely new road, with efforts focused on the most heavily trafficked sections first. The Highways Agency has held a series of seminars and meetings with stakeholders, to set out indicative plans for both options, and take feedback. On the basis of these more clearly defined propositions, few stakeholders regarded the Expressway as an attractive alternative to widening." The statement was rubbish and contradicted previous statements including what the Minister said a year ago. They said that an Expressway would lead to the proportion of HGVs on the M6 becoming unacceptably high. What they omitted to tell MPs was that trucks are more likely to avoid tolls than motorists, many of whom claim the tolls back from someone else. The obvious answer would have been not to toll the Expressway and to lift the tolls on the existing empty M6 Toll. They said that the Expressway would require a much larger landtake than widening - "some 50 per cent. more". This is different to what the Government said in their consultation document. They then said that the Expressway might require only a 35 metre wide stretch, and that widening (by only 2 lanes!) would require on average up to 30 metres. This was one of the points that was dealt with in our response to the consultation - nearly 2 years ago. They said that the Expressway would cost more than widening. In the consultation document they said of the Expressway that there would be "less cost" and "lower cost". Two years ago, the consultation document said that "The expressway could be constructed without affecting traffic on the existing road. Widening the existing M6 would involve disruption and additional congestion during the construction work." Now they said this is more than offset by "the phasing of works could mean additional capacity being provided sooner than an entirely new road, with efforts focused on the most heavily trafficked sections first". They said "few stakeholders regarded the Expressway as an attractive alternative to widening" When there was consultation nearly 2 years ago, there were 6,300 responses from individuals and organisations of which only 106 wanted a tolled expressway. So nearly 99% of people were against this 2 years ago. All in all, another sorry tale of the lengths that the Government will go to to hurt roads users, spend roads taxes on anything but roads, and serve the needs of the Troll interests.